Nicole is 23, and lives in Tampa, Florida. She’s been a fan of rock and heavy metal, since the tender age of 9, and in her teens she started getting into heavier music. 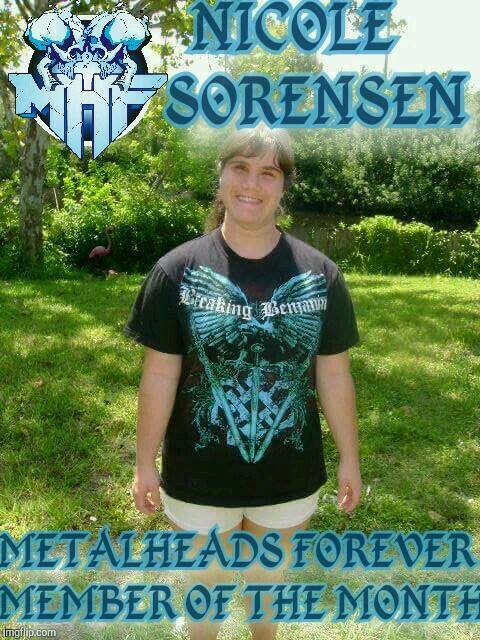 Her list of favourite bands includes Slipknot, Stone Sour, Avenged Sevenfold, Five Finger Death Punch, Breaking Benjamin, Disturbed, Pantera, Metallica, Megadeth, Hinder, Killswitch Engage, Lamb of God, Sevendust, Shinedown, and Bullet For My Valentine. Nicole is an amazing, young woman, with a handicap that by no means slows her down. She is definitely a worthy winner of the title. She’s very active, and her spirit and nature is absolutely admirable. From all of MHF, congratulations Nicole, you deserve the title.